’E CARRIED ME AWAY TO WHERE A DOOLI LAY, AN’ A BULLET COME AN’ DRILLED THE BEGGAR CLEAN. ’E PUT ME SAFE INSIDE, AN’ JUST BEFORE ’E DIED, 'I ’OPE YOU LIKED YOUR DRINK,’ SEZ GUNGA DIN. SO I’LL MEET ’IM LATER ON AT THE PLACE WHERE ’E IS GONE— WHERE IT’S ALWAYS DOUBLE DRILL AND NO CANTEEN. ’E’LL BE SQUATTIN’ ON THE COALS GIVIN’ DRINK TO POOR DAMNED SOULS, AN’ I’LL GET A SWIG IN HELL FROM GUNGA DIN! YES, DIN! DIN! DIN! 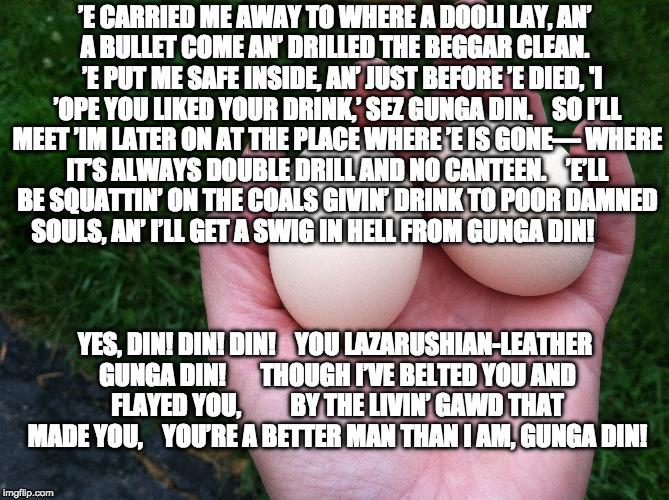 YOU LAZARUSHIAN-LEATHER GUNGA DIN! THOUGH I’VE BELTED YOU AND FLAYED YOU, BY THE LIVIN’ GAWD THAT MADE YOU, YOU’RE A BETTER MAN THAN I AM, GUNGA DIN!